A video has been made capturing how the body digests Ramen noodles, and it might serve as a warning to college students who rely on the cheap foodstuff as fuel. Dr. Braden Kuo of Massachusetts General Hospital used a camera the size of a pill to capture the effects Ramen and other pre-cooked noodles have on the body. 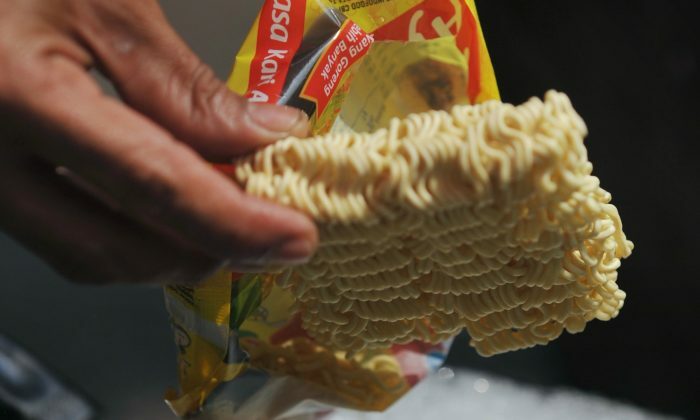 The video showed that after two hours the noodles—which are laden with preservatives like tertiary-butyl hydroquinone—were mostly intact, USA Today reported. In a study in medical periodical The Journal of Nutrition, women in South Korea who ate more instant noodles were more likely to suffer from metabolic syndrome. “Although instant noodle is a convenient and delicious food, there could be an increased risk for metabolic syndrome given [the food’s] high sodium, unhealthy saturated fat and glycemic loads,” said Harvard doctoral candidate Hyun Shin, reported PreventDisease.com. Those with metabolic syndrome can suffer an increased risk of developing heart disease and diabetes. But if you enjoy instant noodles, just moderate your consumption. US Experts: Too Soon to Pull Breast Implants Tied to Cancer?